House fires are terrifying events. If this unthinkable experience happens to you, once your human family is safe, your first thought will be for your animals. Over 500,000 pets die annually in house fires. Fortunately, there are some things you can do to help prevent fires in your home. First, knowing the common causes of house fires will help you lower the risks. Candles are a big cause of house fires, especially on Christmas Eve, Christmas Day, and New Year's Day. Candles can be knocked over by children and pets, or something flammable can accidentally be placed or fall near the flame. Use flameless candles like these to achieve the same look in a safe manner. Dryers are a particularly dangerous area of your home when it comes to fires. Make sure you clean the lint trap and dryer vent routinely to minimize the risk. Fireplaces can cause fires if embers or flames escape and ignite flammable items or if the chimney isn't cleaned regularly. Make sure you do routine maintenance on your chimney and cover the fireplace when it is lit. Heat sources such as space heaters can cause house fires. They can be knocked over easily or ignite nearby flammable items. They can also be a source of carbon monoxide poisoning. Cooking starts many fires every year. Never leave a stove or oven unattended. Smoking in the home is the leading cause of house fires in the United States. The most common scenario is that someone falls asleep while smoking a cigar, cigarette, or pipe, dropping it on a flammable surface such as a couch. Stove knobs should be covered or removed when you leave the house. Curious animals jumping on the stove to see what treats might be there can easily bump the knobs, turning them on and igniting any nearby objects. Stove knob covers such as these are a great safety feature for pets and kids. Flameless candles like these are a much safer option than regular candles if you have a cat. Cats are curious and may jump up to investigate a lit candle. Your cat could knock a lit candle over or rub against it, lighting her tail on fire. Space heaters are even more dangerous when you have a cat. They are easily knocked over, but it's also possible for your cat to bat toys into it, starting a fire. Fireplaces are another source of danger for a curious cat. The dancing flames may entice her to investigate, and she could spread embers or flames throughout the house. Loose wires and cords are enticing to cats and kittens. Make sure that all cords and wires are secured and, ideally, hidden from curious feline claws and teeth. Curious kittens can get into lots of trouble that may be hard to foresee. It's best to confine them to a safe area, with their food, water, bed, and toys when you have to leave so they don't have the opportunity to find danger that you may have missed. Once you've done all you can to decrease the risks of a house fire, you can do some things to improve you and your cat's chances of surviving one if it happens anyway. Smoke detectors are one of your most important defenses against dying or losing your pets in a house fire. The National Fire Prevention Association (NFPA) recommends that you check your smoke detectors once a month and replace them every ten years. You should also make sure you have enough smoke detectors. The NFPA recommends one in every bedroom, outside all sleeping areas, and on each floor of your home. In addition to making sure you have enough smoke detectors and that they are always working properly, it's a good idea to sign up for an alarm monitoring system to connect them to. These services will immediately notify your local fire department if your smoke detectors activate, allowing firefighters to arrive sooner. Window stickers like these allow firefighters to be aware that you have cats that may need rescuing. You can even mark them with the number of cats present in your home. You can work on training your cat to stay away from flames by using clicker training. Start with unlit candles or fireplaces. When your cat reliably avoids these, light the candle, but keep your cat on a leash and harness during training when there is flame present. You can also work on training your cat not to run and hide when the smoke alarms go off. Many times, cats hide when they hear the noise, and this makes it hard to rescue them. Start with clicker training to reward calm behavior when softer noises are occurring, then work your way up to the smoke alarm noise. Keep a cat carrier near the front and rear exits of your home. If you need to grab your cat quickly and exit your house, you can place her in one. Once you're outside, the chaos and noise may cause your cat to try and escape, so having her secured in a carrier will be safest. Have an emergency fire plan. Make sure everyone in your home knows that they should leave the house by the closest exit and stay out if the smoke alarms go off. 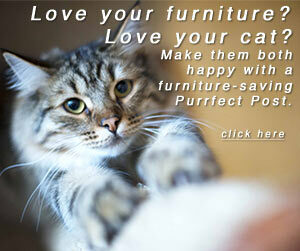 You may designate an adult for each cat in your home, who can be in charge of taking that cat out with them. Knowing your cat's favorite hiding places so you can find her quickly is also helpful in emergencies. If a real fire occurs and you are unable to find your cat, leave an exit door open and call to her from outside, using a calm voice. House fires are dangerous and terrifying events. With a little attention to prevention and preparedness, you and your cat's chances of surviving one will increase dramatically.